This lecture targets at elaborately explaining the Development of Tongue and Thyroid. Section one discusses about the Development of Tongue. In the beginning, the educator has put forward an extensive Overview on the development of tongue. Following this, Development of Tongue from Swellings has been comprehensively been brought into consideration. In the end, the educator has concluded by mentioning about the Subdivision of Hypobranchial Eminence, in depth. Section two is designated to talk about various Parts of Tongue. The educator commenced by speaking about the Sources of Development of Tongue. Subsequently, the educator explains the Development of Various Parts of Tongue. In addition to this, Anterior two-third of Tongue alongside Posterior One-Third of Tongue has been shed light on. Moreover, Posterior Most Part and Epiglottis has also been elucidated, extensively. Moving further, Overgrowth of Third Arch over Second Arch and the Muscles of Tongue have been reported. Additionally, Correlation of Nerve Supply with Tongue Development has also been covered in the discussion. Conclusively, Anterior Part of Tongue and Floor of Mouth has been comprehensively delineated. Section three encompasses Clinical Corelates of Tongue Development. 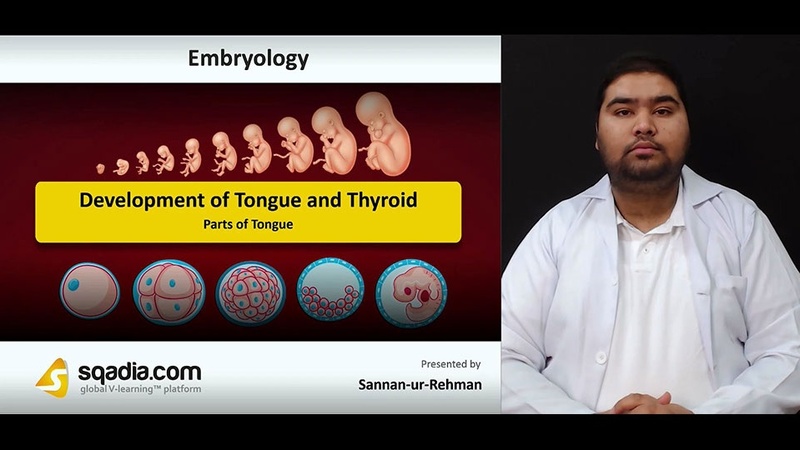 In this segment, the educator has mentioned thoroughly about the Clinical Correlation in certain medical ailments of tongue entitled Aglossia, Hemiglossia and Microglossia, Macroglossia, Ankyloglossia and Bifid Tongue, Lingual Thyroid and Fissuring of Tongue, individually. Section four accommodates the Development of Thyroid. Firstly, the educator has conversed about the Development of Thyroid Gland. Secondly, there is a description of the Endodermal Thickening. Later on, Development of Thyroid Gland and Development of Thyroid Gland in Neck has been broadly reported. Moreover, Thyroglossal Duct, Pyramidal Lobe and Histogenesis of Thyroid Gland has been taken an account of. In the end, the educator has winded up by talking about the Parafollicular Cells. The prime focus of section five is on the Clinical Corelates of Thyroid Development. The educator begun by describing the Anomalies of Position of Thyroid, systematically. Next in line, the educator has interpreted the Ectopic Thyroid Tissue and the Anomalous Lobes and Shapes. Furthermore, Thyroglossal Cyst or Fistula has also been presented. In the end, the educator has wrapped up by discussing about the Accessory Thyroid.